The discovery of a federally listed endangered mussel in the Grand River at Lyons will delay state and local plans to remove the Lyons Dam this year. Additional work and federal approval is needed now before the 156-year-old dam can be taken down, according to state officials. The 9-foot dam at Lyons was slated to be removed this summer. The fish ladder there was to be filled and capped. The dam is considered a hazard and unsafe due to structural deterioration. The village of Lyons has sought funds over the years either to repair or remove the dam. State biologists found the mussel last year, a small freshwater species called the snuffbox mussel. It was added to the federal endangered species list in 2012. 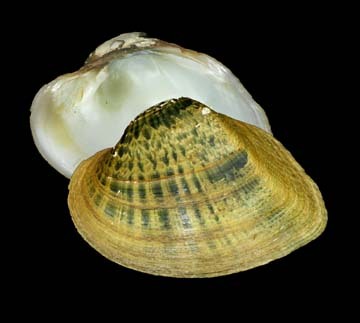 The snuffbox mussel was added to the federal endangered species list in 2012. Photo: US Fish and Wildlife Service. Fish & Wildlife Service. But the population has declined by 62 percent due to habitat loss, dam construction and sedimentation, among other things. Michigan, today, has one of the larger populations. Local officials are rolling with the change. Removal of the dam has been a talking point for many years. They hope to constrain the costs that are now expected to rise. Funding had been secured for the $1.2 million dam removal project. The money was allocated from state and federal programs dealing with dam removal, fish passage and inland fisheries development. But those costs could now rise to $1.7 million with the additional money needed for population surveys, collection and evacuation of any mussels found, and their safe transport to another site on the river. Added costs are also anticipated for rock and fieldstone. Project officials had planned to gather boulders and stone from the river bottom. The materials are needed to create the rock weir that will stand in place of the dam, after removal. Those rocks now will be purchased elsewhere and transported to the river to avoid killing snuffbox mussels. Deconstruction of the dam is being postponed until next year, according to Eldridge, assuming federal approval is granted. State officials say mussels have been found above and just below the dam. Their discovery occurred last year when DNR staffers decided to inspect the river bottom after having heard that the snuffbox was to be added to the federal Endangered Species list. 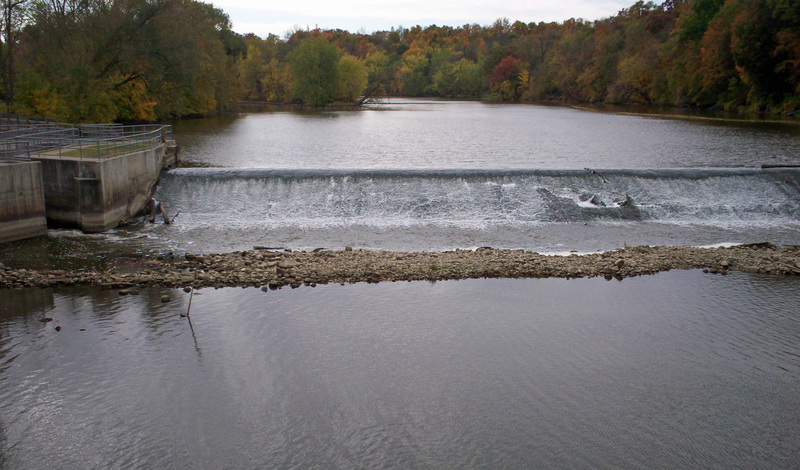 Removing the dam will improve living conditions for the snuffbox and other species like walleye and smallmouth bass, according to Wesley. Restoring the flow of the river has several benefits. It will allow walleye to migrate further upstream and the faster flow will be beneficial to bass which like higher-gradient waters. It will also be beneficial to the endangered mussel, which requires a fish host to successfully spread to other areas. “The female mussels hold the larval mussels and then grab the snout of a logperch, a darter species which is found along the bottom,” Hanshue said. “They pump the larvae into the logperch gills and parasitize them for a short period. At a certain stage those larvae will drop off the host fish and grow on their own along the bottom. This entry was posted in Uncategorized and tagged Conservation, Dam, Dam removal, DNR, Endangered Species, Environment, Grand River, Lyons Dam, Michigan Department of Natural Resources, Snuffbox mussel, U.S. Fish & Wildlife Service. Bookmark the permalink.